Look at all those beautiful pans. Look how perfectly organize they will stay. They have a tutorial for installing this rack that they purchased, but I am pretty sure this could be pretty easy to DIY! This is going on my list for the new house! GENIUS! <3 I'm sooooo doing this!!!!! I want this when we remodel my kitchen!! Love this! I think it is so much more efficient and practical to keep pots and pans hanging, but I like clean lines too much to want them hung out in the open. So this is the perfect solution for me! Love it! I did something similar. Instead of buying a pot rack kit, I just used some large hooks I purchased at a home improvement store and converted a corner cabinet. 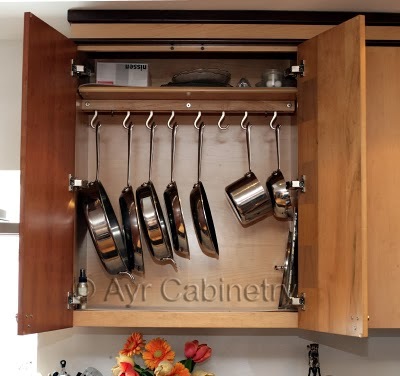 I thought my corner cabinet with the lazy susan was rather useless, so turning it into a pot rack cabinet was a no-brainer. It was one of my favorite projects of 2010.